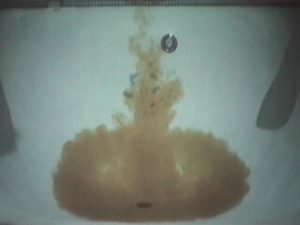 A more detailed water chemistry report which addresses this myth was published in the Journal of the Swimming Pool and Spa Industry, and can be viewed by clicking here. 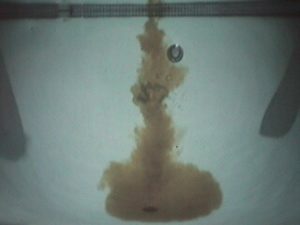 Although the onBalance team debunked the Acid Column Theory in the Journal of the Swimming Pool and Spa Industry over twenty years ago, a debate on this topic once again surfaced recently on an online forum of pool service techs. But if acid is “trickled in” (added) by walking it around a pool and evenly distributing it throughout the water, the pH will be preferentially lowered, with only a minor decrease of alkalinity. The plain and simple fact of the matter is that a given amount (or “dose”) of acid added to a fixed volume of water (the pool) will result in an identical reduction of both pH and alkalinity. Every time. No matter how it is added. That’s the rule, that’s the science, and it can easily be demonstrated at poolside by anyone with a test kit. 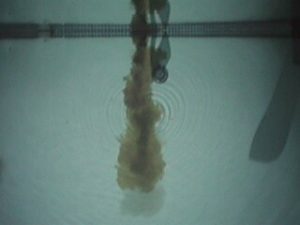 What happens when acid is added in a concentrated fashion to a pool? Since acid is noticeably heavier than water, the acid sinks to the bottom, and flows to the lowest part of the pool. If that lowest part happens to include an operating main drain or an operating suction-side cleaner, the concentrated acid dose winds up in the circulation system. In fact, we have performed experiments adding acid in this manner and have verified (with pH meters and probes) that this method can indeed create conditions where the pH of the water at the bottom of the pool is less than 2.5. 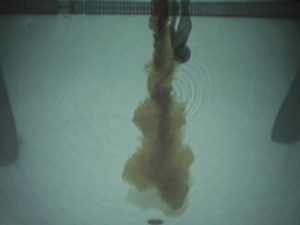 Although the movement of the water will eventually dilute and blend the acid into the rest of the pool, the initial contact of concentrated acid can potentially etch the plaster it touches and attack the circulation system it flows through. 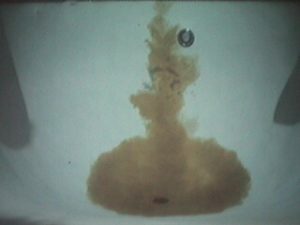 Even adding several smaller “slugs” of concentrated acid will result in this puddling of acid on the bottom – try adding dye to your acid and watch it. It’s fun – if you are not worried about etching the bottom of the pool wherever the acid flows! 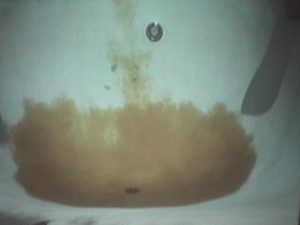 Of course, etching the plaster and corrosion of the circulation components is generally considered a bad thing… yet the proposed treatment process (“slugging” the acid) recommends this potentially damaging treatment technique, all for the sake of a theoretical, unfounded attempt at chemistry manipulation. Even if it worked (which it doesn’t), is it worth the risk? It is time to get this myth laid to rest and stick to what is scientifically sound. And we need to quit risking damage to pools in our care. 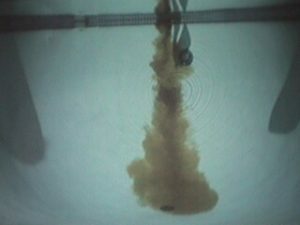 The pictures below depict one quart of “dyed” acid (pool acid with phenol red powder dissolved into it…) being added to the deep-end of a pool with the equipment shut off. 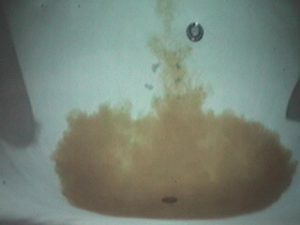 The acid puddle remained that way for more than 45 minutes.